Quality Kubota automatic standby generators are perfect for home and small commercial backup power. You will appreciate the ease of installation and low maintenance of this series 100 genset. All units are designed and engineered with commercial grade components to ensure excellent performance, long life and reliability. 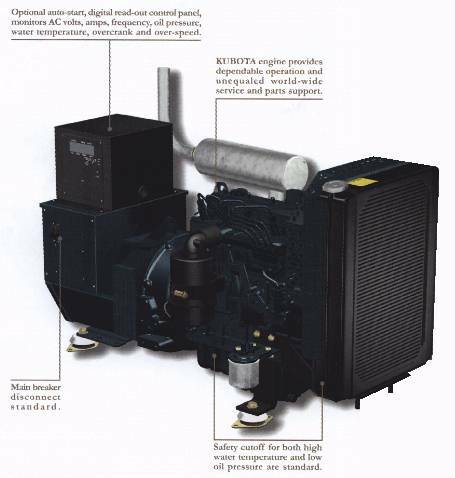 Kubota Diesel Engines: four-cycle industrial diesel engine, water cooled, CARB certified, fuel filter system with electrical fuel pump, and 1800 rpm mechanical governor (3-5%). AC Generator: +1% solid state voltage regulator, main disconnect switch, direct-driven industrial grade, and brushless. Cooling System: high ambient design, engine driven fan, radiator, fan guard. Skid Base: Powder-coated steel, light gray weather resistant, with vibration isolators. Control Panel: key start, hour meter, and safety shutdowns for high coolant temperature & low oil pressure, main line circuit breaker (for single phase models). Silencer: industrial grade with rain cap. Filters: air cleaner, spin-on fuel filter. Block Heater: for better cold weather starting. Auto-start capable control panel. Digital display indicates ac volts, amps and frequency, oil pressure, overcrank, coolant temperature, and over-speed (required if using automatic transfer switch). Weather resistant steel enclosure with light gray powder-coat finish. Designed for tamper resistant installation. Locking latch system for weather resistant enclosure. 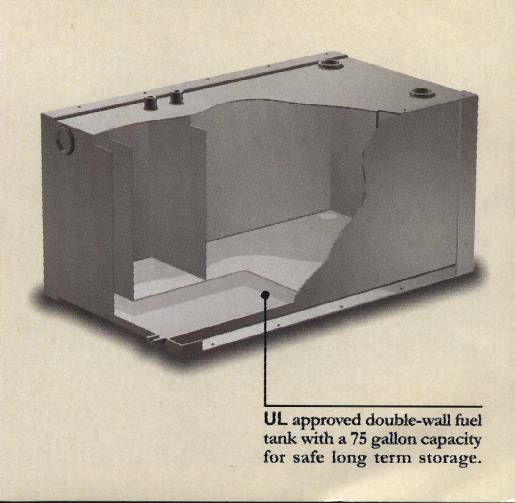 Base fuel tank capacity of 75 gallons, double walled UL approved for stationary fuel storage. AC generator connected for 3 phase output. Electronic isochronous governor for precision +1% frequency regulation. Warranty on entire unit is 1 year or 2000 hours. Kubota engine only is 2 years or 2000 hours, 3 years or 3000 hour major components only (head, block, crank, cam). All units ratings are established at 1.0 power factor, 68F and 500ft elevation above sea level. 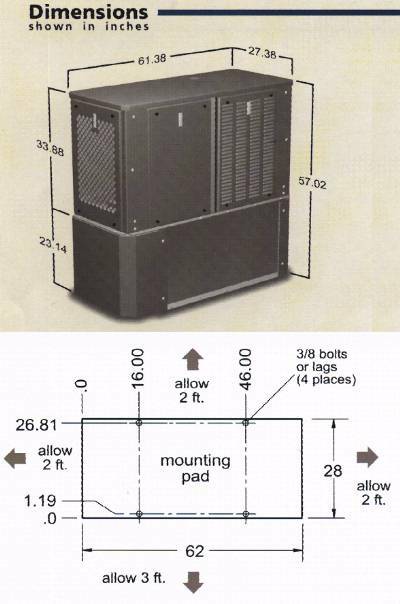 Derate unit by 3.5% for every 1000ft above 500ft and 1% for every 10F above 68F. Weight listed is without tank. This item normally ships in approximately 2-3 weeks (8 weeks w/ tank) or less.